Quiltville's Quips & Snips!! : Midnigh Flight, All Day Long in Georgia! What do you get when you mix 35 quilters, loads of fabric, a bunch of sewing machines and a pot luck lunch? A very fun work day for making some beautiful blocks that will be even more beautiful quilts! I spent yesterday with the Etowah Valley Quilters of Cartersville, Georgia, a cute little city town north of Atlanta where hills are rolling and the Georgia southern drawl runs as thick as the Georgia southern hospitality! I was last with this group a couple of years ago, and it was wonderful to feel like I was spending my birthday with friends! Sew much fun on a vintage 301! Even the quilt guys joined in on the fun! You are one cool quilt dude, Richard! What a great 53rd birthday for me! The pattern for Midnight Flight is found in my book MORE Adventures with Leaders & Enders. Click the image below if you are unable to view the slideshow on your mobile device. You’ll be taken to the photo album for viewing. I arrived at my son Jason’s home last night in Columbia, South Carolina, a 5 hour drive from Cartersville. A birthday dinner out at Bonefish with Jason and his girlfriend Jenny filled the last hours of the evening. I got to love on my grand kitties! Dresden, a 7 year old cuddle bug! Lola, a 3 year old sweet girl! I’m packing my bags back into my car. I’m on a mission today! Meeting up first with Randy in Charlotte, grabbing groceries for the week while we wait for Lori’s flight to come in around 7pm! 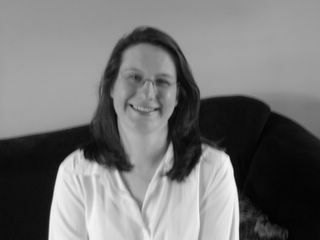 Then we will be on our way up to Quilt Villa for a week of girlfriend sewing retreat time! Hooray! Yes, definitely the best birthday week ever! 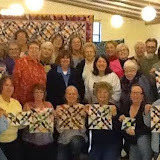 my favorite photo is of the guy...just shows you that quilters are not just little ol ladies, lol...everyone looks like they are having a blast! What a fun day, with friends, ladies and even a man! That's great! My fabric giveaway is still running, you are welcome to enter to win fabrics from Fat Quarter Shop! Safe travels & wishing you much fun! I love those times when my birthday lasts a week or more. I have a big one coming up soon, hope it lasts as long as yours and maybe it will include some quilting fun, too. Can't wait to hear what you guys get up to! !